Its name comes from the country of Africa where it is mined. The agate is a type of quartz made of parallel, concentric or waving bands and can be found in different colors. The Botswana agate is characterized by a chromatic scale playing with whites and grays. This silica stone has been known for more than 5 000 years by Phoenicians, Assyrians and Sumerians who would cut it to make ornamental pieces. In the antique Egypt, a few amulets in the shape of sacred scarabs were cut from agate stones. They probably thought that this stone would bring strength and longevity. In Africa, the Botswana agate was often used in fecundity rituals to have healthy and strong descendants and an important sexual life. 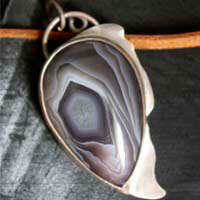 Middle East civilizations would particularly look for Botswana agate which patterns would be in the shape of an eye. They were meant to protect against negative effects and injuries. They were often offered to gods to have good harvests. It is the stone of peace. It would be used to cure nervous system problems and would help to detoxify the body. Botswana agate would help to lower stress, depression and anxiety. It would be good against tobacco addiction. It would get rid of spiders. 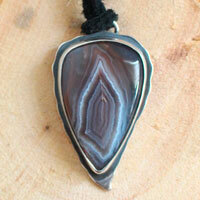 Botswana agate would help with sexual problems. It would help the body to better assimilate oxygen. 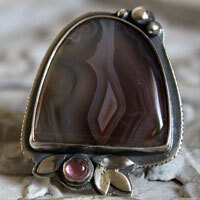 Botswana agate would eliminate skin toxins. It has the same healing properties than the agate in general.